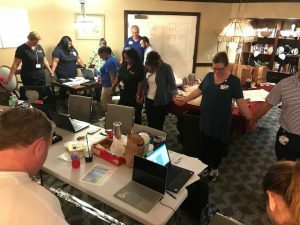 Another incredible Hurricane Florence story as SHC Tanbark took care of 61 residents that had also evacuated from our sister facility in Norfolk, Va.
SHC at Tanbark stepped up and accepted 61 residents from our sister facility in Norfolk, VA. From Department Heads, to nurses, CNA’s to dietary and housekeeping, the teams worked so hard together to make sure that our residents were safe and at the same time created everlasting memories really defining “teamwork”! 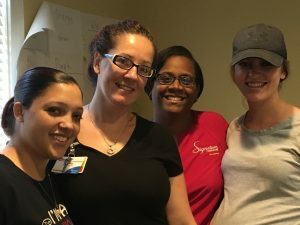 Tanbark more than doubled it’s occupancy on the Personal Care Unit and to quote Nikki Schilling, CEO/Administrator at Tanbark “the team did it with a smile” It’s times like these that definitely remind us why we do what we do. It’s a calling and we are so fortunate to have been called to do so! Our stakeholders from both Norfolk and Tanbark will never forget this experience they shared. Even the local community got involved as they provided fruit, brownies and extra food. 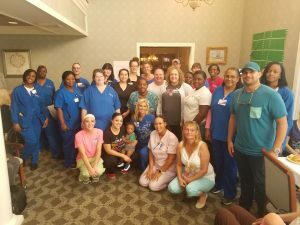 A kudos to the teams from Norfolk and Tanbark as they shared love and compassion for all…..because that is who we are and this is what we do at Signature HealthCARE! This entry was posted in Uncategorized on September 27, 2018 by Kathy Gallin. 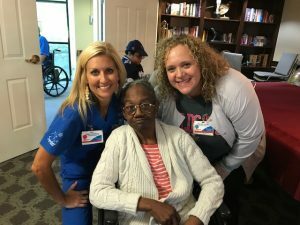 Celebrating our Veterans…Did you know?